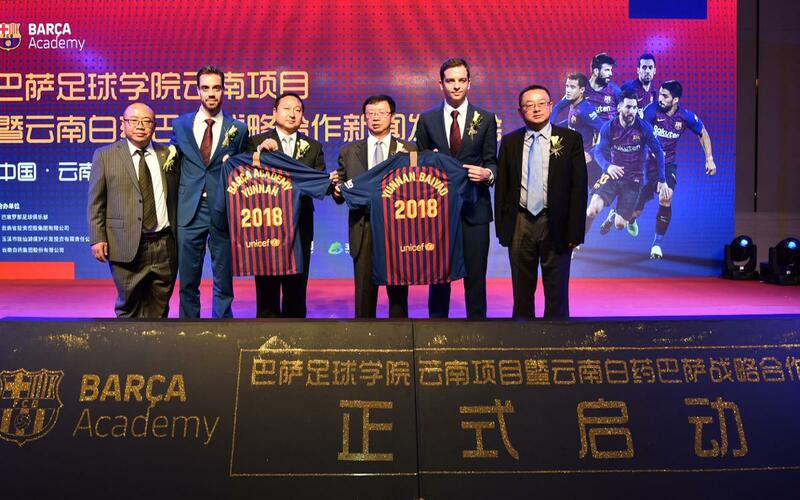 The Barça Academy project will have three new venues located in the Chinese province of Yunnan following the agreement signed between FC Barcelona and Yunnan Baiyao, with branches in Lijiang, Kunming and Fuxian Lake. Following these additions, the Barça Academy will have a total of 49 schools around the world, 18 of them located in the Asia Pacific. China thus becomes the country in the region with the most sports training centres, a total of six. These new schools are part of the plan to promote football development in the province of Yunnan. They will be managed by Yunnan Investment Sports and Yuxi Fuxian Lake Protection Development and Investment Co., Ltd. The comprehensive training of young athletes will be developed by setting up these academies, holding Barça Academy football and basketball camps, a Barça Academy Clinic in Barcelona and expanding the Barça playing style with a Barça Academy Coaches Clinic to train local coaches. On Saturday, FC Barcelona and Yunnan Baiyao announced a sponsorship deal in Yuxi City, whereby the Chinese company becomes the club's regional partner in China, Hong Kong, Macao and Taiwan for the next three seasons. This is the first time that FC Barcelona has been associated to a sponsor in the region with an eye to a different type of relationship than a commercial one. The deal with Yunnan Baiyao as a regional sponsor represents an important milestone in the growth foreseen by the 2015-21 Strategic Plan approved by the Board of Directors for this mandate, and is part of the club's goal of proactively seeking partners that are best suited to its values ​​and realities, and sourcing the best contracts in the world of sports marketing and sponsorship in each category. The arrival of the Barça Academy in Yunnan has been made possible thanks to the strong support of the local authorities, as well as the leading figures in sports and education in the province, in addition to Yunnan Baiyao's commitment to FC Barcelona as a regional sponsor. The Kunming and Lijiang centres are ready to open right now and construction work is underway on a large international training centre in Yuxi Chengjiang, Fuxian Lake. Barça Academy is FC Barcelona's own football school model aimed at boys and girls. Its main objective is the comprehensive education of its pupils. This kind of soccer school has been exported internationally, the aim being to expand the Barça brand and teach the rest of the world about the club's philosophy and values. The schools work by their own, special system, based on the Barça methodology used from the youth teams through to the first team, focusing on a creative and attacking style of play and the indispensable element of teaching values: respect, humility, effort, ambition and teamwork, with tried and tested results. FC Barcelona currently has a total of 49 Barça Academy projects around the world, more than 180 Camps and 50 Clinics, and is present in 53 countries on five continents, involving more than 45,000 children in the different activities that it runs. These Barça Academy projects are divided into Barça Escola de Barcelona, ​​the Barça Academy Pro in Haikou (China) and New York (United States), the Barça Residency Academy Arizona (United States) and the 45 Barça Academies scattered over the five continents. Yunnan Baiyao was developed in 1902. It is a well-known trademark in China, the initial National Innovative Enterprise and a world renowned time-honored Chinese brand. The key economic indexes of Yunnan Baiyao Group has led the pharmaceutical industry in China since 2006, and its market value exceeded 100 billion yuan in 2017. With technologies, products and management, Yunnan Baiyao renovates muti-brands system and extends successfully from pharmaceutical brands into the fields of health and services. It continuously tops the pharmaceutical industry in China Brands Lists issued by Interbrand, Hu Run and BRANDZ™ . Recently, the businesses of Yunnan Baiyao involves pharmaceuticals, personal healthcare, Chinese Medical Resources, medicine logistics and so on. Its products are sold well in China, Southeast Asia and gradually enter the market of developed countries such as European countries, USA and Japan. Hundreds of millions of people have used the products. Yunnan Baiyao completed mixed ownership reform in 2016, which brought vitality and vigor to this century-aged company. It will spare no efforts to build healthcare industry, provide better products and services for customers and represent China to participate in global competition.